This history of the Royal Artillery’s boy trumpeters covers not only the 1920s and 30s ~ when some 3,000 of them were trained at the Grand Depot at Woolwich in London and various Depots in India until the 1940s ~ but is also the tale of the trumpeters who were so much a part of the British Army over the centuries. 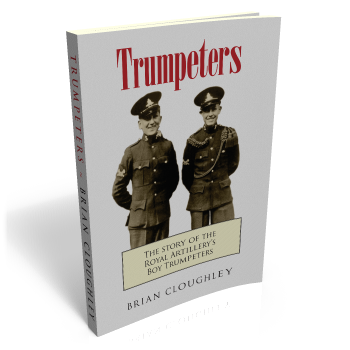 Many members of the Association of Trumpeters contributed their personal recollections to this informal history. Despite the fact that in the years when they were trained, and afterwards, conditions were extremely tough, today we might even think them barbaric, not one expressed regret about his time in uniform ~ although the passage of years may have eased some of the more sensitive memories. In this book, many trumpeters describe their family backgrounds, military training in England or India and subsequent military service, much of it in India, for that is where the majority of trumpeters went or stayed. They mustered to man service at the age of 17½ or 18 and the later adventures around the world of some of the Badgies, as they were known, are described within these pages. ‘Badgie’ is derived from the Hindi baju, meaning ‘music’. Badgie wallahs were the music men and timekeepers in days when there were no other means of notifying large numbers of soldiers that they were required for various duties. The boy trumpeters sounded calls for all activities of the day ~ from reveille to lights-out ~ and the sound of their trumpet calls was indelibly etched into the collective memory of all who served in the military in those far-off days.